Come by Black Gold Casino along Highway 70 and try your hand at hitting pay dirt! We’ve got more than 200 of the best new e-games and our customer service is top-notch. 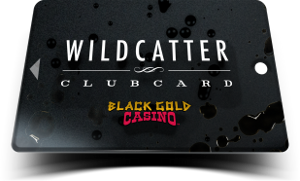 While you’re here join the Wildcatters Club and pile on the benefits. Being a member of this club means more chances to win every time you play. That’s the thing about Black Gold—you never know which play will be the one to strike it rich.